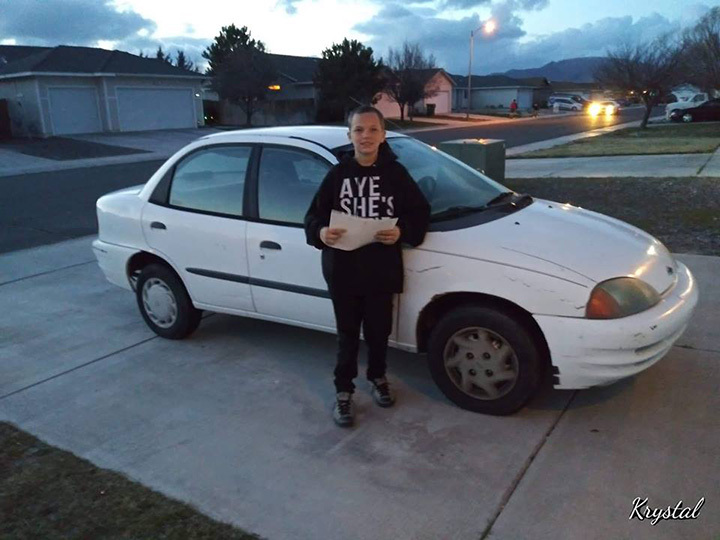 William Rabillo, 13, surprised his mom, Krystal Preston, with a 1999 Chevy Metro during what she has called a "low point" in her life. "I have no words right now that can express how I am feeling at this moment. I'm in complete shock ... The last couple weeks have literally been hell filled with so many tears, anger, confusion and heart ache. Today I got the shock of my life.. I started balling my eyes out. I am speechless my 13 year old son bought me a car. He did some work for this women and that was his payment that he worked out with her. And here I thought it was a joke... Nope I was handed the keys and paperwork to the car and I'm freaking out but so in shock like OMG this is happening right now. So we got into the car it started right up and off we went. I am so proud of my son. He is such a good kid. He may have his days but OMG what 13 year old kid do you know that buys his mom a car... William I love you son and thank you. You have such a big heart and I love you..."
"I saw on YouTube where people get their mom a car and then surprise her with it," William said. "I wanted to do that." "It was really cheap so I asked her if I could trade it or earn it, and at first she said no," he said. "After she thought about it, then she said yes."